A often asked question is: “Can I create a templated report where I can create a PowerPivot workbook for my customers that will point to a database on the customers network”. This can be very useful for example as an ISV where you have a product that is installed on a customers domain and has all its data in a database but the database server name is different at each customer. 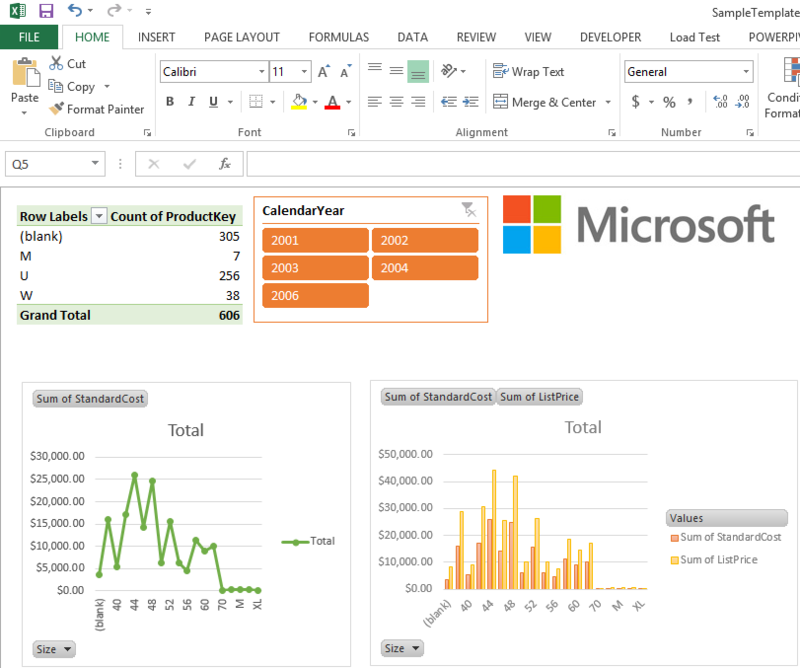 You still want to give out a PowerPivot workbook that just automatically gets its data from the right database so they can do their analysis on their own data, It would be very nice if we can package the PowerPivot workbook with the client application when installing on the clients machine. This used to be nearly impossible, the good news is with Excel 2013 you can use Macro’s to do all kinds of magic :). Imagine I (the ISV) have created the following report in Excel 2013 based on the database that comes with the product that I deliver to the customer. Nothing unusual yet. Now I want to make sure that when the workbook is opened on the clients machine it points to customers database and not the database as was configured when creating the workbook. I want to make sure the destination is configurable during installation so it can be picked up during workbook load. For example we could add a registry key in the client installer the ISV supplies we that contains the database and server name. 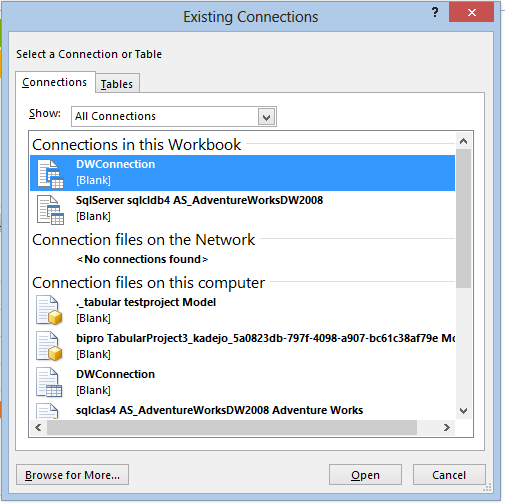 Now I want to use the information from the registry to update the connection in the PowerPivot workbook when the client open the workbook. I have written a macro that will do that for us, this will check if the connection exists in the workbook and get the information from somewhere (registry/file/etc) and update the connection in the workbook if need. If we updated the connection string it will refresh the connection. That’s it .. now all we need to make sure of this gets executed when the workbook is started, we can do that with a Workbook_Open() function. You have to make sure the code is running in the ThisWorkbook part of the Excel workbook to make sure the Workbook_Open actually gets run. Ow and also make sure you save the workbook as XLSM instead of XLSX. That’s all there is to it, as you can see the Excel macros make it very easy to manipulate the data model. You can download the sample workbook here. Next PostWhat is new for the Tabular model in SQL Server 2012 SP1 and compatibility level. I know this is an old post but I run into this problem now and this is a fantastic solution. How do I apply that to an Access connection that takes the file path from a cell in the workbook or a text file I sent to the client? I had an initial connection with MS Access data source which I plan to move to sql server. Is there any way I can do it without rebuilding the model? Hi, I know this is pretty old, but hoping someone comes across it. Your method works perfectly for a data model with only one query. However, if I go to the data model, choose Home > Get External Data > Existing Connections and choose the DWConnection, I can add another query to my data model, but then the macro no longer is able to update the connection string. Do you have a suggestion for how to handle complex data models that require many queries from the same connection?